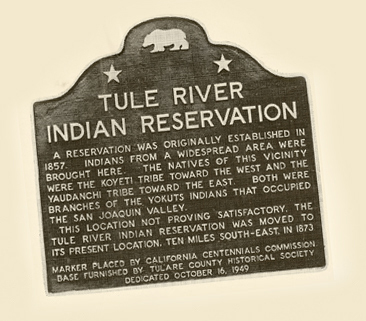 Since 1948, the Tulare County Historical Society has placed markers to commemorate historical sites, individuals and groups, some as joint projects. Additional details regarding each marker can be found in Los Tulares (LT) issues, as noted. A utopian project started in 1886, for several years attracted international attention. Unable to secure title to the land and because of internal difficulties, the organization ceased to exist after 1892. 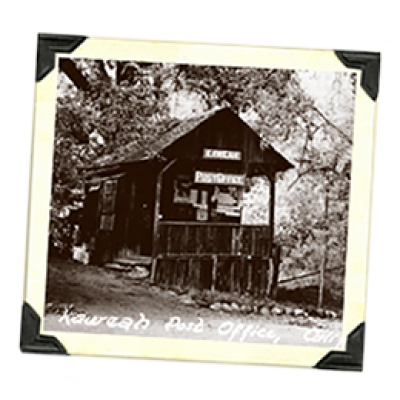 The Kaweah Post Office is a tangible reminder of the colony. 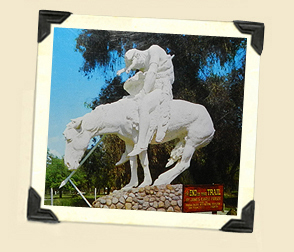 Began as a gold mining camp about 1856 during the Kern River gold rush. Mining has been carried on here intermittently since the time of discovery. 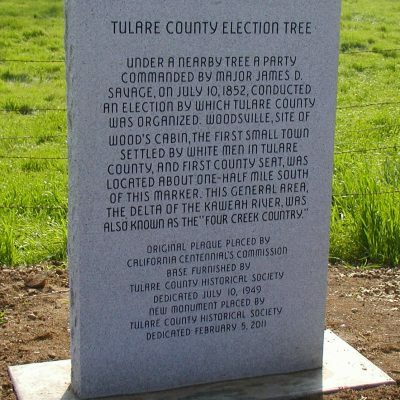 At this tree, a party commanded by Major James D. Savage conducted the election on July 10, 1852, by which Tulare County was organized. Woodsville, the first permanent settlement, was located south of the monument. 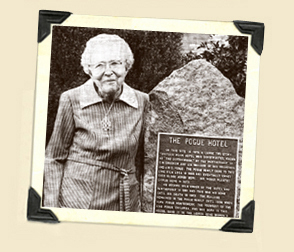 The original plaque on the landmark was stolen and destroyed in 2009. A re-dedication ceremony was held February 5, 2011, with new monument marking the site. Was originally established about three miles east of Porterville in 1857. Indians from a widespread area were brought here. The marker is on the grounds of the Alta Vista School. Here Peter Goodhue operated an emigrant trail stopping place on the bank of the Tule River, until the river changed its course in 1862. It was a Butterfield Stage Station 1858-1861. The marker is at the road intersection seven miles east of Ducor, about a mile and a half south of the old settlement, which dates back to at least 1855. It was a station on the Butterfield Route. Highway 65 west of Lindsay followed the old Los Angeles-Stockton road, established about 1853. It was used by the Butterfield Stages 1858-1861. A trail used by John Charles Fremont on his famous exploring expedition to California. The date on the marker should be 1844. It is located next to the Butterfield Stage Station marker (above), west of Lindsay. 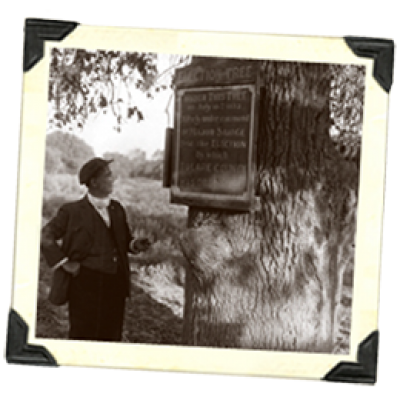 This marker is a memorial to those who have preserved a part of the Valley Oaks that formerly covered the Kaweah Delta. The area was visited by early explorers. Benjamin Willis settled here in 1852. The grove was owned by the Mooney family until purchased by Tulare County for park purposes in 1909. This is probably the oldest cemetery in the southern San Joaquin Valley. The marker is located on Avenue 324, off of Road 168, east of Ivanhoe. 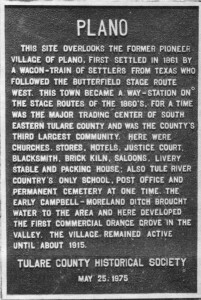 This marker overlooks the former pioneer village of Plano, first settled in 1861 by a wagon train of settlers from Texas who followed the Butterfield Stage Route west. This town became a way-station on the stage routes of the 1860s. The marker is two miles south of Porterville on Plano Road. Running north and south, following an older Indian trail, is the route taken by many Spanish expeditions, American trappers, traders and parties of exploration. 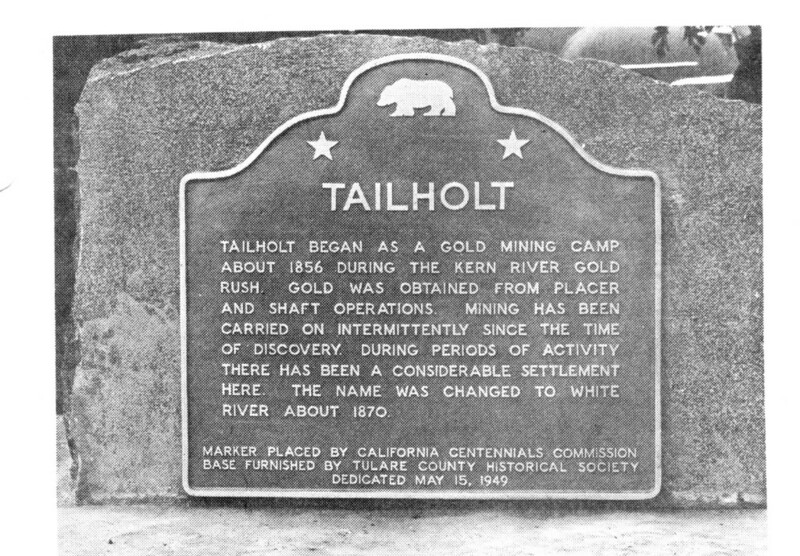 The Old Stage Road was the major inland route of gold seekers to the northern and southern mines and was the first public road in Tulare County. The marker is located at Fountain Springs, east of Ducor, on Avenue 56. Former home site of Ina Stiner, Porterville's foremost historian. The plaque is placed in the sidewalk of the Ina Stiner home on "E" Street, Porterville. From 1868-1912 flour gristmills operated on this site, which were very important to the area. Using an extension of a ditch from the Monache Reservation to provide water power - dug by Indian labor in 1863, and water taken from the Tule River five miles upstream - the first mill was built by John Fleck and Henry Clarke, to grind grain produced in the surrounding area and provide food for the community. The marker is located at East Putnam Avenue (between Plano Street and Leggett Drive). When gold was discovered in the Coso Range on the east side of Owens Valley, there was a need of a short route to the supply town of Visalia. John Jordan, who had settled in the lower Yokohl Valley in 1861, petitioned the Tulare County Board of Supervisors for the right to build a toll trail across the Sierra. The marker is at the side of the Yokohl Road, near the intersection with Highway 198. Rocky Hill Inc. granted an easement for placing the monument. The hotel/home was built in 1879 by J.W.C. Pogue and his partners. The Pogues came to the Lime Kiln area in 1865 and planted the first citrus in the foothill district. It is the first house in the Lemon Cove townsite laid out by J.W.C. Pogue in 1894. The George Stockton Berry marker is placed on the grounds of the Lindsay High School. Berry was among the first to plant oranges and olives in the Lindsay area and had a vineyard. He was a member of the Assembly in 1888 and was elected to the State Senate in 1890. Berry was also a member of the Lindsay School Board in the 1890s. Located at Avenue 314 and Road 220 in Exeter, this plaque was donated by Carol Buckman and her father, Phillip E. Buckman MD. The rough, mounded land is typical of what much of the Tulare County prairie along the base of the Sierra looked like before farming began. The marker is placed at the Woodville Memorial Building and commemorates the centennial of the district. The marker is placed near the fire station in Ivanhoe and is dedicated to the founding of present day Ivanhoe. Marks the artesian well at Artesia, south of Waukena (now in Kings County). By 1885, there were 250 artesian wells in the county, all of which helped develop the semi-arid west side for agriculture. Overlooking Lake Success in Porterville, this marker is dedicated to the early pioneers of Tulare County east of Porterville. This dedication grew from the many campers at Balch Park and the people who knew of Allen I. Russell's hard work in improving Balch Park during his assignment there from 1961-1990. 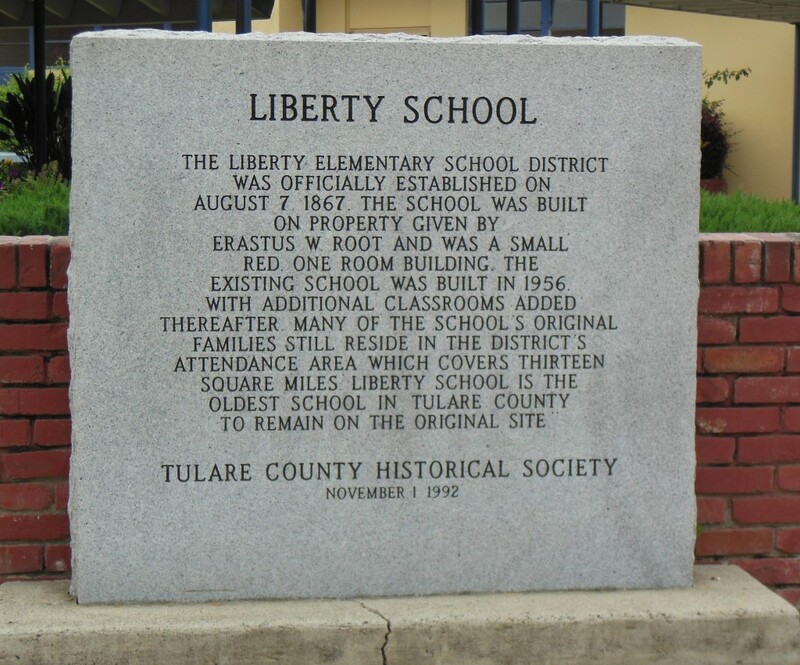 The marker commemorates the 125th anniversary of the school's founding and is located at Mooney Boulevard and Liberty Road in Visalia. Located on southeast corner where Tulare Lindsay Hwy. 137 meets Hwy. 65. 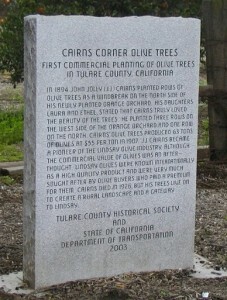 Marks the site of the first commercial planting of olive trees in Tulare County by John Jolly (JJ) Cairns in 1894. Cairns was a pioneer of the Lindsay olive industry. Marker placed by TCHS and State of California Department of Transportation. The Tulare County Historical Society and the 150th Anniversary Committee of the Nativity of the Blessed Virgin Mary placed this monument. 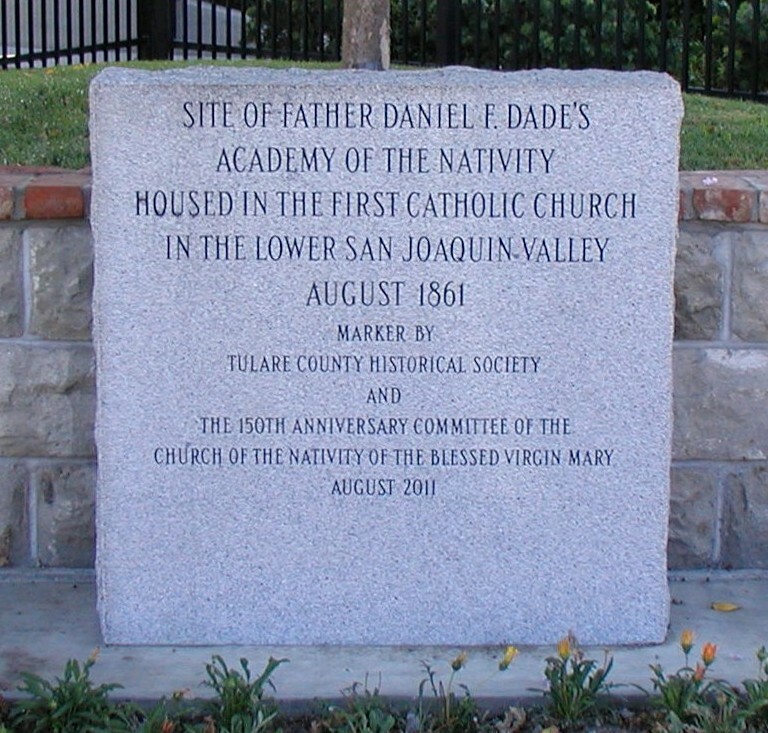 It commemorates the site of Father Dade’s Academy of the Nativity housed in first Catholic Church in the lower San Joaquin Valley (1861). Located at 520 North Church Street, Visalia.